Mine: If "Star Wars" made me a movie fan, "A Little Romance" turned me into a movie freak. I saw it first at the Cinemart Twin in Hamden, then twice at the Milford Post Showcase, and once at The Lincoln Theatre (the last movie I saw there). Great perfomances all around. Won best score Oscar�. Just see it!! Leonard Maltin/Plot synopsis: Engaging film about relationship of young American girl (Lane, in her film debut) living in Paris and running off with a charming French boy (Bernard), chaperoned by wily old con man (Olivier, wonderfully hammy). 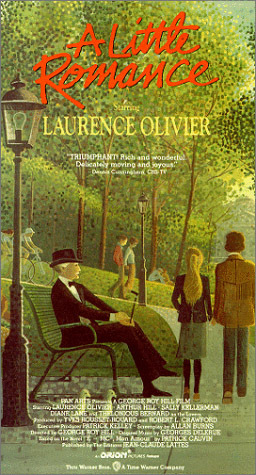 A throwback to director Hill's WORLD OF HENRY ORIENT in its winning treatment of adolescence, but not quite as good. Crawford has funny cameo as himself. Georges Delerue's music score won a well-deserved Oscar. Panavision. (out of 5 stars) This movie marked my life. Tears were running down my eyes, unforgettable. (out of 5 stars) I ABSOLUTLY ADORED "A Little Romance"!! I was impressed by most of the acting in the show and found myself rolling on the floor laughing everytime Natalie (Ashby Semple) came on the screen. LOL OMG "The kids don't come out funny or anything; I checked! ", hahaha. What a mervelously goofy presence. Diane Lane was quite impressive as well. Geez, as I said the whole cast was just perfect. T'was an adorable little romance. I can't wait until in come out on DVD, so that I may enjoy all of its quirkiness all over again. I definately reccomend it, though be warned you have to be in a certian type of mood to really appreciate it.